October 30, 2011 Dan O.
I can’t ever look at my cat the same again. Voiced by Antonio Banderas, the dauntless feline of legend goes on an animated adventure to purloin a priceless golden-egg-laying goose. To help him on his mission, Puss brings along his friends Humpty Dumpty and the super-stealthy Kitty Softpaws (Salma Hayek). Having a spin-off of the famous ‘Shrek‘ series seems like a hard thing to accomplish with any film, but it seems like no matter what, cute little kitties always prevail victorious. I know I sounded really soft right there but still, it’s true. Even though this is a spin-off, I still felt like this was a lot better than the last two films of that series and probably because it just didn’t try too hard at all for anything especially the humor. The jokes felt natural and were very funny without trying to make any Hollywood in-jokes or jokes that went way too over the little kids that inhabits these films heads. Another reason why it’s so fun is because it just looks and feels like it. I didn’t see this in 3-D but I could tell that it probably looked so beautiful with all of the vibrant colors they had displayed in almost every scene. There are some scenes where it is taking place in a desert, in the sky, or in a small Mexicano town, and just about every scene looks very detailed and gorgeous. There’s also plenty of action that keeps this plot going as it almost never stalls and just feels over-done because the action comes so often and frequent in case this film had any chances of slowing down. This film also works especially if you love cats or have a cat, like myself because there is so much they do with cats here it’s not even funny. A lot of the crazy things that cats do all somehow come into play with this story and made me laugh and probably appreciate my little cat named Henry, a lot more. Things they do such as howl in the middle of the night and driving people around them crazy, or following shiny lights, or even giving those little cute eyes whenever they want or need something. No matter what the crazy thing was, the film made me have a whole lot more fun with the whole cat angle as well. Also, I’ve never ever wanted to actually go up to the screen and actually pet it more than I ever have with this film. I mean Puss just looks so soft and cuddly, how could I not? The problem I think that this film runs into is that I was expecting exactly what i got, which isn’t necessarily a bad thing but then again it’s nothing special like it could have been. I think the problem that this film ran into was that everybody knows the whole formula this film goes through because what it is spun-off of. This sounds dumb to some, but for me I guess I just would have wanted some originality when it came to what it was trying to do with its story. Another thing that kind of kept this film away from being taken to the next level was that it is essentially a 70-minute film stretched into a 90-minute film, which to some may not seem like a total problem but it does drag on just a tad too long for my own liking. By the end, I kind of more or less just wanted the film to get on with itself. I was also pretty bummed that there’s no real mention or any reference to the other ‘Shrek‘ films which I would have really liked but hey I guess you can’t really judge a film on what it doesn’t have and more or less what it does. The cast for this film is also very good especially Antonio Banderas as our furry little hero for the nest hour 30 minutes. This is basically Zorro as a cat the whole time, but Antonio keeps him funny, suave, and overall just a totally cool and lovable kitty. He’s a fun character and its really easy to see why they would want to do a film that’s just all about him, instead of continuing the story about the donkey and the ogre. Salma Hayek joins him as Kitty Softpaws and does a great job with her first time at doing a voice for a film. She has a lot of fun energy that goes very well with her character and how the animation makes her look. Zach Galifianakis is pretty funny as Humpty Dumpty and doesn’t really do much else but how his voice sounds adds a lot to the overall look and feel of this character and what I would expect him to actually sound like. He looks more like a Conehead rather than an actual egg, but hey, he still looks like Humpty Dumpty would. There are also other voices such as Billy Bob Thornton and Amy Sedaris as Jack & Jill and director Guillermo del Toro as Moustache Man / Comandate. Consensus: Puss in Boots may not be ground-breaking, or wholly original but for a spin-off it features a lot of humor, fun, and beautiful animation to give this a very fun treat for kids, adults, and cat lovers everywhere. It is good and surprisingly a lot of fun. Thanks Ipodman! Thank God. I’d heard a few people give this a good old eye-roll when they heard it coming down the pipeline, so I’m glad to hear it’s entertaining and not a complete sell-out of the character. It’s not surprisingly and it’s actually a whole lot of fun. Thanks Rod! It kind of is Candice. Terrific review. You really do the feline community justice! 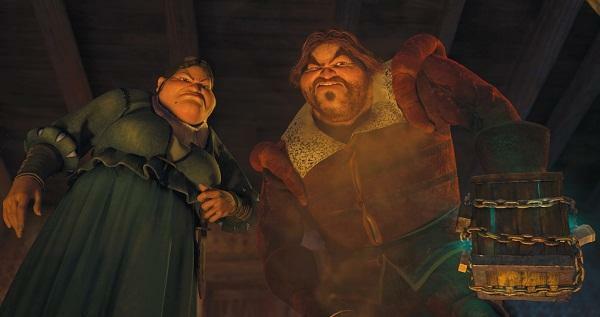 The film may be a Shrek franchise spin-off sequel on the surface, but is actually a prequel of sorts. It was fun and silly, a little long, but otherwise a purrfectly good time. It’s a little too long but very fun, and totally works on it’s own film and limitations. Thanks! Nice review. Although there are plenty of beautiful colors and scenery, I still didn’t find it worth seeing it on 3D (and I watched it in 3D). Like yourself, I also enjoyed this spin-off and wasn’t upset that there was no mention of Shrek. I honestly felt they probably wanted to seperate the two, and I thought they did an excellent job with that. Puss was definitely enough to stand on his own. Thanks for stopping by my Page! Puss is awesome and I’m so glad that this film did that character, and Antonio Banderas justice. Thanks Taj! Nicely written, Dan. Much thanks for commenting on my review. Please keep stopping by to comment, and I will too! No problemo Danae! Thank you! Interesting point about this needing to be a 70-minute movie. I keep looking toward The Emperor’s New Groove as an example of an animated film that gets in, does what it needs to with high energy, and gets out. There were too many moments in Puss that lingered – an extra dance scene, more meandering in the clouds, a bit too much detail on Puss’ backstory – and could have been removed. I did enjoy it, and the more I think about Billy Bob and Amy Sedaris’ roles the funnier they seem (with a nice bit of well played gender substitution as well). Nice review, and thank you for the commentary. It was fun, a little too long I have to say, but still did have enough energy and class to it where I was enjoying myself plenty throughout the whole film. Thanks Andrew! Dan, I agree that if you’ve seen enough of these contemporary animated films, this isn’t the freshest of films. It’s a fun enough ride though. This is a very fun ride which I was not expecting. Thanks! it’s a lot of fun and hopefully I hear more from ya. Thanks! Check it out, it’s pretty good. Thanks! Love your review of Puss In Boots! You seem to really have a gift for reviewing movies. I will be coming back for more. Managed to see this a few weeks ago. It was better than the last two Shrek films. But it also helped that Puss in Boots had new characters to work with. Hayek and Galifianakis were good.